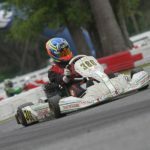 The final day of action at the Ocala Gran Prix during the opening event of the 2018 United States Pro Kart Series turned up the heat a few notches. The Southern Grand Prix hosted Round One and Two of the series, and Sunday’s racing provided more excitement to kick-off the season. The central Florida facility was blasted with a hard rain storm just after the Saturday events had been completed, which prompted the cancellation of podiums as the storm loomed on the horizon. The track was a bit damp on Sunday morning, although no rain tires ever made it to the course. The format of the day also changed, jumping from the two heats and main to the longer laps in the Prefinal and Final program. Clouds covered the area, yet no rain fell, and the second round was completed with seven class winners on the day. The X30 Pro category belonged, once again, to Austin Garrison. The Fullerton pilot set fast time in qualifying, as he did on Saturday, laying down a 37.036-second lap to secure the pole position comfortably. He ran uncontested to the win in the 20-lap Prefinal, and was looking to complete the weekend sweep in the Final. Saturday runner-up Armin Cavkusic (FMS / FA Kart) knew, as did all the other competitors, that he needed to strike Garrison early-on to have a chance at knocking him off the top spot. Armin took the lead on the opening lap, only to lose it two circuits later to Garrison. The Saturday winner then laid down the fastest laps of the race to pull away to a four-second advantage after 28 laps. Although Austin took the win on-track, Garrison’s front bumper was dislodged enough in one corner that officials handed down a two-position penalty. The call was protested and denied, and therefore, the victory was handed over to the runner-up, who just so happened to be Zach Hollingshead. The OGP / Tony Kart driver was clearly the second quickest kart on the track behind Garrison, and he ran away with the second spot on track, only to be elevated to the victory come podium time. Brandon Jarsocrak (KSNA / Kart Republic) was third, and was then promoted to second with Garrison dropping down to third. Maks Kowalski (FMS / Merlin) placed fourth to end his rookie weekend strong while Cavkusic dropped down to fifth. Hollingshead had a strong weekend and completed his sweep of the KA100 Senior main events, dominating the Final on Sunday. Saturday runner-up Josh Hotz (FMS / Merlin) set fast time in qualifying, but he was shuffled back to third in the Prefinal by Hollingshead and Morgan Healey (OGP / Tony Kart). The outside lane was slow at the drop of the green, and that was all that Hollingshead needed to lead all 24 laps en route to his second victory in the category, and third overall on the weekend. Healey was able to work her way back to second after falling down the order at the start. Hotz came on strong at the end, however, slipping past Healey for the second position. Colton Ramsey (Innovative / Kart Republic) was right there in fourth, with Dylan Gennaro (Top Kart) won the fight for fifth. In X30 Junior, Tyler Gonzalez was challenged throughout the day, but proved to be too strong. His SCR / Tony Kart teammate Kyffin Simpson stole the fast time in qualifying with Junior rookie Nicholas Terlecki (FMS / Merlin) finishing second in the session. Gonzalez drove his way forward in the Prefinal for the win, and both Simpson and Terlecki were right there. Terlecki was penalized for a bumper being pushed back, which left Gonzalez and Simpson alone up front. In the main, Gonzalez led all 24 laps for the victory, and Simpson took second. After his penalty in the Prefinal, Terlecki drove through the field to get an impressive podium finish in his rookie weekend. Kyle Thome (FMS / Merlin) was one spot short of another podium in fourth, while Aaron Benoit (J3 / CompKart) completed the top-five. The KA100 Junior division welcomed a second winner on the weekend. 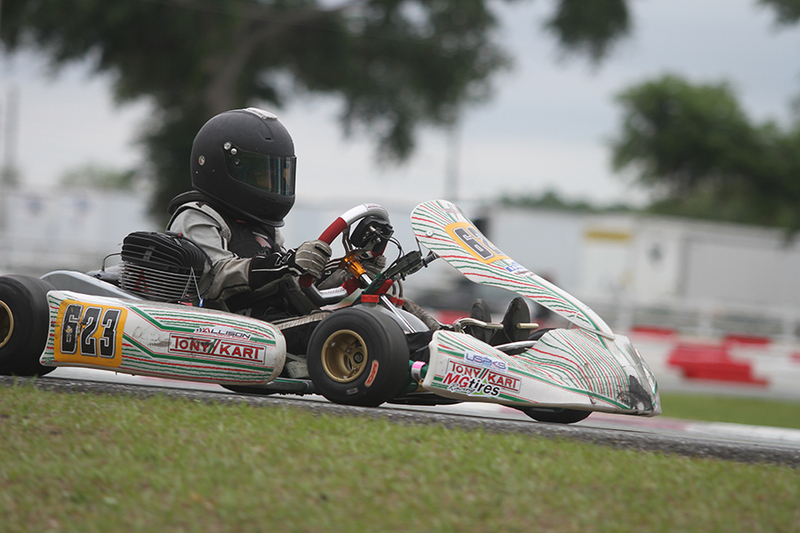 Saturday victor Jacob Graham (Tony Kart) came up two thousandths of a second short of the pole position on Sunday, as Spencer Lofton (Tony Kart) was quickest, taking the top spot. Graham was shuffled back to sixth early on in the Prefinal, but fought his way forward and took the win over Lofton. 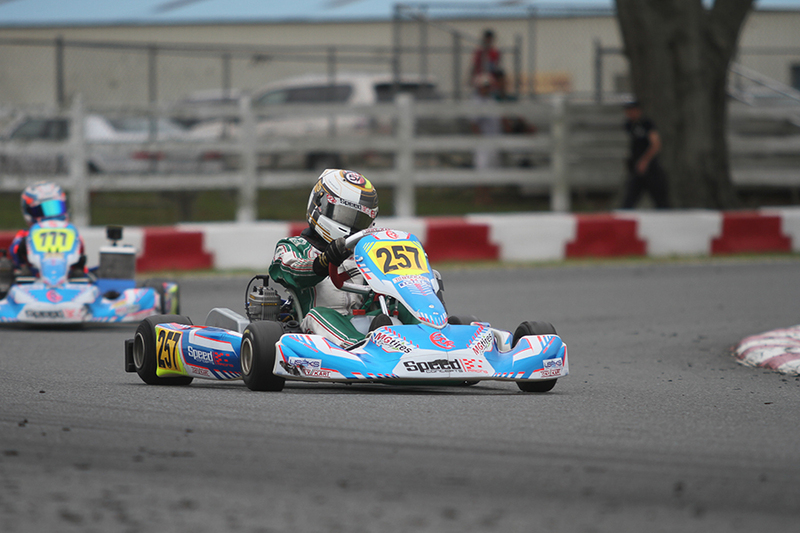 The duo eventually got away from Westin Workman (Top Kart) to settle the Final on their own. Graham led the majority of the race until Lofton took the lead in the closing laps. 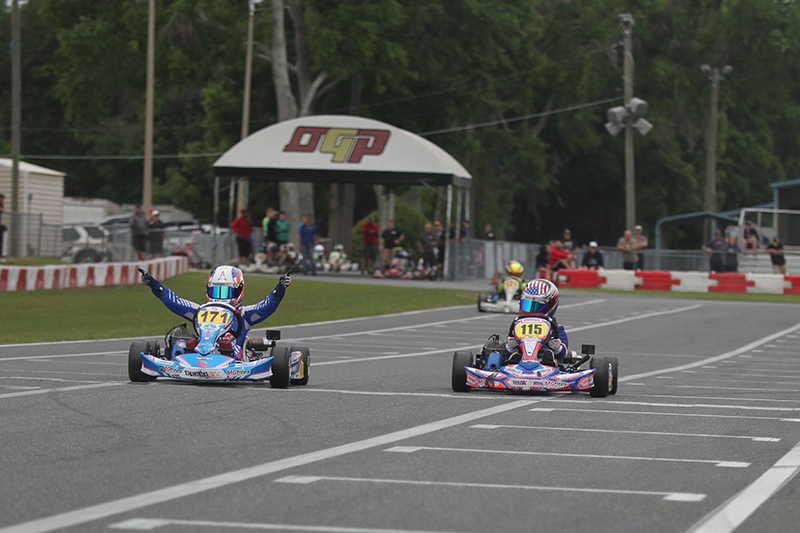 Lofton then held on to the checkered flag for his first USPKS victory. Graham settled for second, while Tyler Wettengel (FA Kart) took third ahead of Workman. Donald Whorton II (FA Kart) came up just short, ending up fifth. Things were tight from the get-go in the X30 Masters class. The top three drivers were separated by just 39 thousandths in qualifying with Scott Roberts (Tony Kart) setting fast time. Danny Robertson (Tony Kart) made it an OGP 1-2 while Jonathan Silva (CompKart) sat third. Silva was quick early in the Prefinal, and got away to score the race win to secure the pole for the Final. Silva led the opening circuit of the Final, only to lose control and spin. He collected Roberts and Robertson, with all continuing on, however, it put Pete Fritsche (Tony Kart) into the lead. He led until Laurentiu Mardan (Tecno) took over the point. It wasn’t long before Todd Shambo (FA Kart) put himself into the lead. The Georgia driver posted the fast laps of the race to lead the remainder of the race, scoring his first USPKS victory. 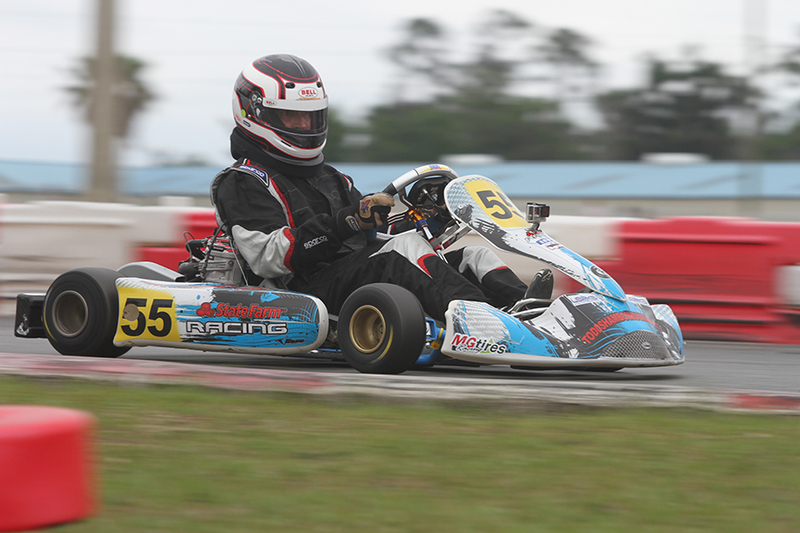 Mardan, running his first weekend on the Tecno chassis, got quicker as the weekend went on, placing second. Scott Falcone (Formula K) was provisionally third, until receiving a two-position penalty for his bumper, dropping him to fifth. This promoted Robertson to the podium in third, with Rob Maier (Tony Kart) in fourth. The Mini Swift category was busy with action all day, welcoming first-time winner Paul Bocuse (Energy). Bocuse set fast time in qualifying, but found himself in fifth at the Prefinal checkered flag as Brent Crews (Nitro Kart) earned the win. The early laps of the Final were frantic, as Kai Sorensen (Benik) and Bocuse were able to get away from the field. Sorensen led the majority of the race until Bocuse slipped past on the final circuit. Bocuse held on to reach the checkered flag first by just 0.037 over Sorensen. Jeremy Fletcher (Tony Kart) won the fight for third ahead of Noah Baker (Energy), who recorded the fast laps of the race. Saturday podium finisher Alex Powell (Energy) ended up fifth. The streak continues for Ben Maier in the Micro Swift category. The Nitro Kart driver has won at least one main event at every race he’s attended in the 2018 season thus far. Maier made it a sweep on Sunday to even the score with Caleb Gafrarar (Parolin). Maier ran away in the Prefinal for the win, but was not able to get away in the Final. Ethan Ayars (Parolin) joined the party early, but eventually lost the draft of Gafrarar and Maier. As the lead duo took the white flag, Maier was holding the point, and Gafrarar pulled the trigger, making a bold move in turn one. The attempt failed, and Gafrarar was never able to close back up over the final corners of the lap. In the end, Maier took the victory over Gafrarar, while Ayars held on to third over Ava Dobson (Merlin). Cameron Brinkman put a second Merlin into the top-five. 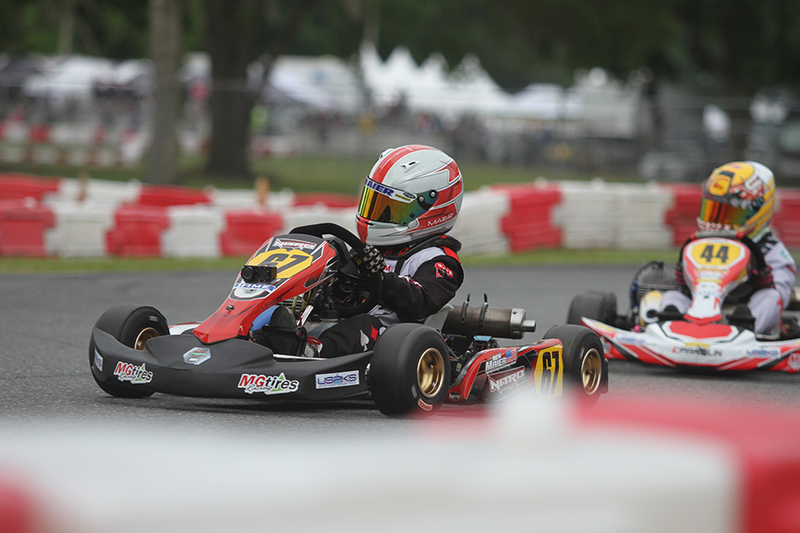 The opening round of the 2018 United States Pro Kart Series featured exciting racing, and certainly served to lay down the framework for what will be a strong season of competition in the IAME classes. 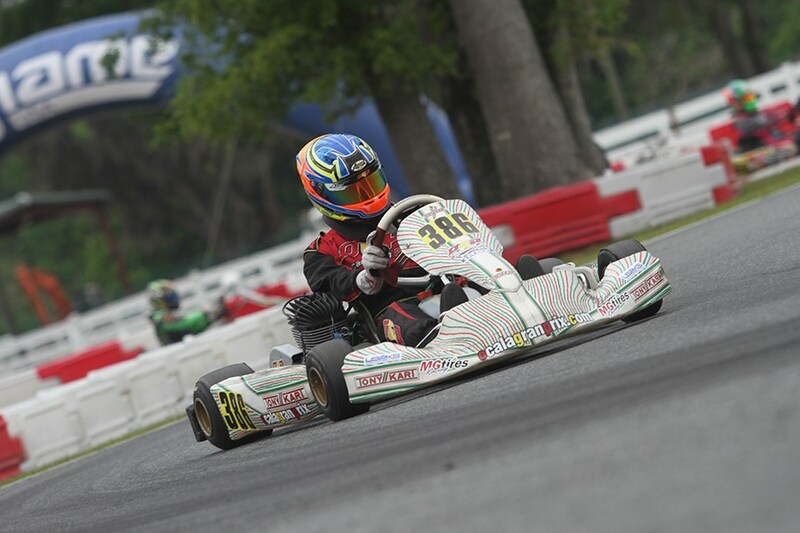 The next round of the series is the Carolina Grand Prix, set for June 15-17 at GoPro Motorplex in Mooresville, NC.